The 1968 GT500KR Mustang - also known as the King of the Road, was introduced by Ford over forty years ago. Not one for understatement, the Shelby GT350 got a boost with the now famous 335 horsepower 428 Cobra Jet, which leap-frogged the powerful for it's day, 250 horsepower small block 302 cubic inch V8. Under Shelby's engineering, the motor received some good old hot rod modifications, with an aluminum intake manifold,revised heads and pistons. Advertised horsepower stayed the same as the standard 428 Cobra Jet, but rumor is that its actual output was more likely around 400 hp. And as it happened, the end of production for the Shelby AC Cobra spelled the beginning of the Mustang Cobra, with Carrol Shelby keeping the name alive under a Ford Mustang badge. The exterior styling of the 68 GT500KR Mustang was classic Shelby, with its longer more aerodynamic nose, fiberglass hood with forward mounted functional hood scoops. 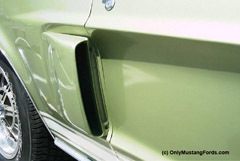 The sides of the car had specially made scoops, clearly telling the world that this was no mere Mustang. 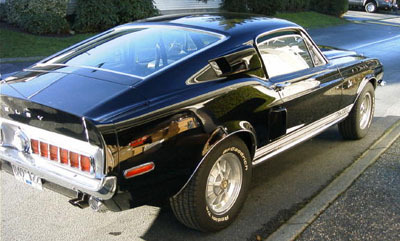 The Gt500KR rear end had its own special treatment with larger fender extension end caps and an integral spoiler molded into the rear trunk lid. 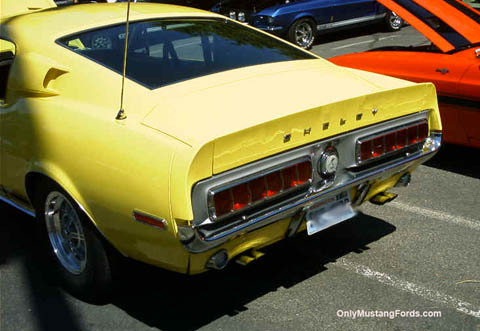 The 1968 GT500KR Mustang's tail lights, like those of the GT350 were sequential units sunk into the rear fascia. The rear valence housed cutouts for the dual exhaust. 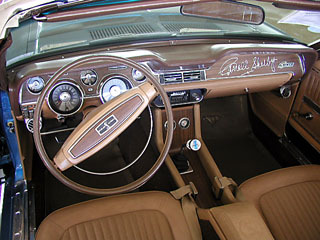 The interior of the the 1968 King of the Road Mustang was a modified version of the deluxe 1968 Mustang fastback . Carrol Shelby also added his own functional touches, including functional gauges in the console, an integral roll bar and upgrade wood accent trim. With the availability of the new big block 428 Cobra Jet motor, the GT500's 428 police interceptor engine was replaced by the newer engine, which although rated at a conservative 335 horsepower, actually produced 400 horsepower. 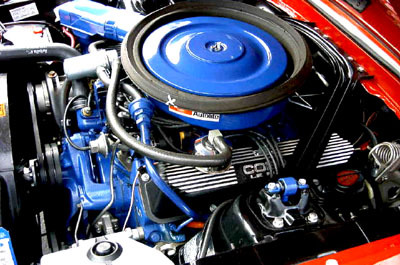 To aid airflow and improve performance, it was equipped with a functional ram air induction system. Performance was strong, with a 0-60 mph run at about 6.4 seconds and the quarter mile in 14 seconds. What is a 1968 GT500KrR Mustang Worth? As of this writing, If you are lucky enough to find a nicely restored King of the Road the price tag is likely to be in excess of $140,000 and one that I know of, sold for an unheard of $250,000. Who says you lose money when you buy a car?